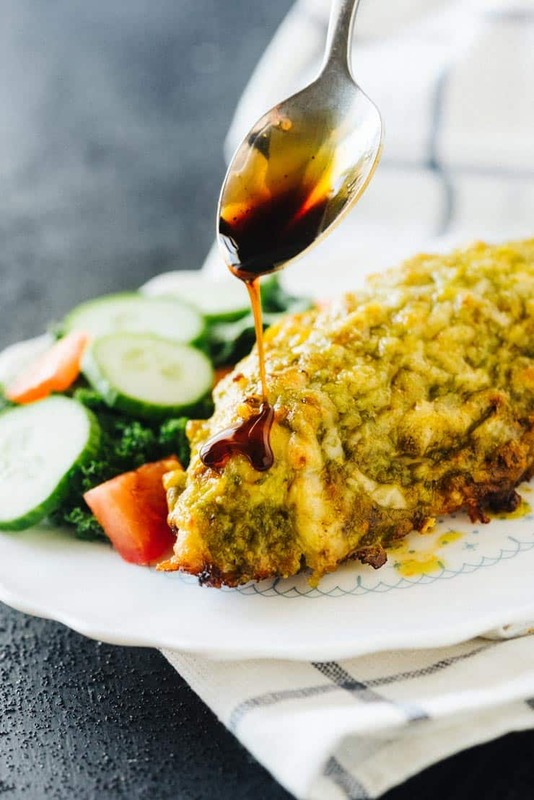 This Baked Pesto Chicken is tender and juicy and uses only three ingredients to create tender and juicy chicken that is on the table in about 30 minutes! 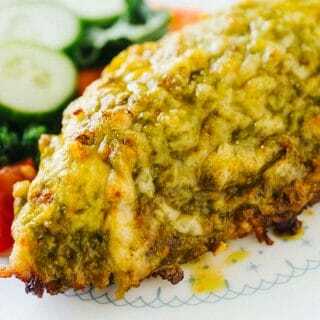 I love this Pesto Chicken! It’s often my I-don’t-know-what-the-heck-to-make-and-I-didn’t-go-grocery-shopping-yet fall-back recipe and pleases many a mouth at my dinner table every time. It’s great because you only need a few ingredients for it and it delivers great big flavor without a lot of work. With only three ingredients needed for the chicken and 2 for the sauce, you’re bound to have just about everything you need already. Let’s take a look! You can use whatever brand or type of chicken breasts you’d like. Recently I’ve been buying the big bag of frozen thin-cut breasts from Costco, and I love them! 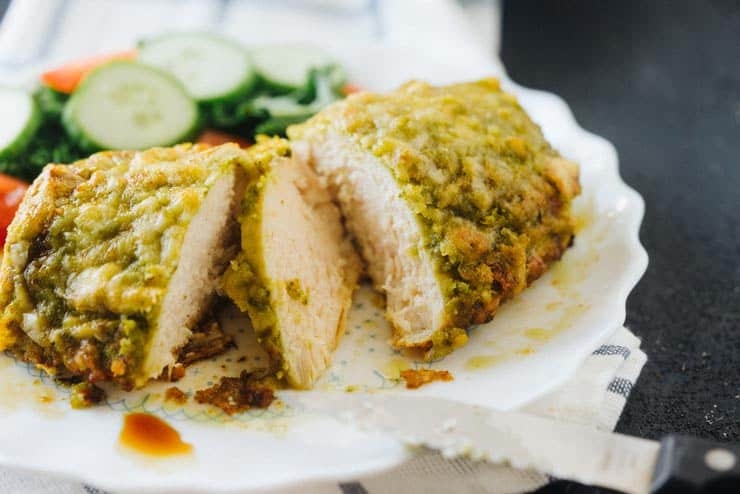 The breasts are all pretty evenly sized and shaped, and since they are cut in half cross-wise to make them thin, one breast is the perfect serving size of pesto chicken! I promise Costco doesn’t sponsor this post, but again, my favorite prepared pesto sauce is from there. I use the Kirkland Signature brand pesto from the refrigerated section. It comes in a large jar and is around $6-8, depending on where you live. I usually freeze 1/2 it in a Tupperware container as my family can’t go through the whole jar before it spoils. The flavor is fresh and is much more budget-friendly than buying small containers of it at the regular grocery store. Even though pesto already has a good helping of parmesan in it, we need more! I’m not too picky about the parmesan cheese I use for this pesto chicken because it’s more for texture than anything else. I typically reach for a bag of shredded (not finely grated) parmesan at the supermarket, and it works great. The cheese sits right on top of the pesto on the chicken and browns, making a nice, cheesy crust. This step is totally optional, but I like to drizzle my finished pesto chicken with a little bit of balsamic glaze. It adds just a touch of acidity and sweetness to the rich chicken and really makes the meal complete. You can buy balsamic glaze many places (Trader Joes has a good one), but it’s pretty simple to make your own and only takes two ingredients. I’ll walk you through the process below. This pesto chicken gets baked at 375 degrees so make sure to preheat your oven. Line a baking sheet with parchment paper or aluminum foil. If using foil, make sure to spray it with cooking spray, so the chicken doesn’t stick to it. Lay the chicken breasts on the lined baking sheet, spacing them evenly apart. Spoon about one and one-half tablespoons of the basil pesto over each chicken breast, spreading so that the chicken breast is covered. Follow the pesto with about two tablespoons of grated parmesan cheese. Pat it gently on top of the chicken so that it doesn’t fall off. Place the chicken in the oven and bake for about 15-20 minutes or until no longer pink in the middle and juices run clear. Make the balsamic glaze (optional) while the chicken is cooking. Combine balsamic vinegar with brown sugar in a saucepan and stir it together until the sugar is fully dissolved. Bring the mixture up to a simmer and allow to cook until it is reduced by about half and it is the consistency of warm pancake syrup. 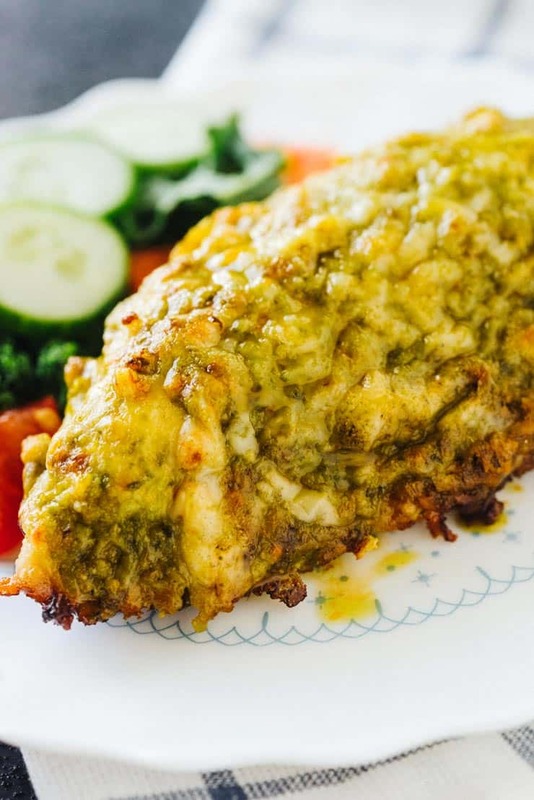 Remove the glaze from heat and drizzle over the finished baked pesto chicken before serving. No two chicken breasts are the same size, so the amount of time it takes to bake the chicken breasts you’re using will vary. A medium-sized chicken breast should take about 20 minutes to cook. The best way to know if your chicken is done is by using a food thermometer. Not only will it take a lot of the guesswork out of the cooking game, but you’ll also get to enjoy perfectly cooked meat! Just insert the thermometer into the thickest, middle-most part of the pesto chicken and read the temperature. Chicken is fully cooked and safe to eat when it reaches 165 degrees Fahrenheit. What Side Dishes Go Well With Pesto Chicken? These Super Creamy Crock Pot Mashed Potatoes or Super Crispy Oven Roasted Garlic Potatoes would go great with this chicken. Or if you’re in the mood for rice, try this Easy Baked Rice Pilaf and these Brown Butter Green Beans Amandine! The nice thing about this chicken is that it pairs well with just about anything! These Baked Chicken Breasts are topped with prepared pesto and a good helping of parmesan cheese. They are baked until golden brown and crispy on the outside and tender and juicy on the inside. Place chicken breasts on a baking sheet lined with parchment paper or greased aluminum foil. Sprinkle salt and pepper over both sides of the chicken breasts. Spoon about 1 1/2 tablespoons of pesto one side of each chicken breast. Then, sprinkle 2 tablespoons of parmesan cheese on top of the pesto. Place chicken in the oven and bake for 15-20 minutes or browned on the top and no longer pink inside. Use a food thermometer inserted into the thickest part of the chicken to insure it has reached a safe temperature of 165 degrees Fahrenheit. Combine balsamic vinegar and brown sugar in a small saucepan and heat over medium heat. Stir until the sugar is fully dissolved and allow to simmer until the mixture is reduced by about 1/2 and has thickened-- about 8-10 minutes. Remove from heat. Store in an airtight container up to 3 weeks in the fridge.